Have you ever tried to help someone you love who is stressed or overwhelmed and only had it backfire? Everyone responds to stress differently and needs different things to heal. This article will show you some quick and easy ways to identify stress in your loved ones and help them based on their personality type. Taking on too many responsibilities, but feeling unable to say “no” to any of them. You may start to notice signs of stress in an ISFJ when they become especially quiet and withdrawn. At first they might seem agreeable, but there’s an underlying insecurity that seeps into their mannerisms. They tend to see so many ways that things could go wrong that it becomes especially hard to make decisions. They become especially conflict-averse but also feel pessimistic, irritable, and overwhelmed. As a way of dealing with all the uncertainty and frustration they tend to take a rigid stance on something as a way of finding some focus. Be friendly, but not too overbearing. Give them a chance to get some alone time to process and reflect. Remind them of times they’ve overcome similar stressful situations in the past. Put a problem or task in sequential order. Let them express their fears and worries without chiding them. Take them seriously. Don’t be patronizing or condescending. Don’t try to “brainstorm” if they are severely stressed. This can make things worse. You may start noticing signs of stress when an ISTJ becomes withdrawn, shut down, or inexpressive. Stressed ISTJs tend to feel depressed and confused, as if there are too many ways that everything could play out negatively. The more stress increases the more frustrated they will become. It can feel to them like their outer world is in chaos and they need to involve themselves and “buckle down” to make a plan that will work. Unfortunately, in a stressed state they can’t think as clearly as they’d normally like to. They become more critical than usual, more pessimistic, and more sidetracked by negative possibilities. Be calm and direct with them. Let them know what to expect, what the plan is. Be patient as they express their thoughts and concerns. Give them some space to sort things out for themselves. Break a large project down into sequential steps. Take them seriously. Don’t patronize or condescend to them. Give them a break from unnecessary responsibilities if possible. Refrain from being emotional or overly-concerned. Don’t “baby” them. They hate this. Not getting credit for their work. Being pressured to decide on something too quickly. Not having the ability to improvise or be creative. Being stuck in a rigid structure with inflexible rules. Not getting enough alone time. Having to do work that is meaningless or doesn’t coincide with their values. Having to project too far into the future and make long-term decisions. When ISFPs first start experiencing stress they tend to feel restless, defiant, and irritated. They want some freedom from whatever structure or authority is trying to impose itself on them. This can lead to careless or impulsive behavior as they try to regain some freedom or excitement. On the outside they may appear quieter than usual yet rigid in their views. The more stressed they become the more harsh they tend to become. They tend to become more sarcastic and cynical, obsessed with mistakes, and filled with an urge to “fix” all the problems around them. Give them space and time alone to sort things out and calm down. Be friendly without being too overbearing or expressive. Give them time to reflect and integrate more information or perspectives. Validate their feelings and listen to them. Don’t give them advice unless they ask for it. Be patient if they need to vent or express their frustration. Not having a clear direction for themselves. Not seeing progress on their personal goals. Being micro-managed or overly controlled. Having to make long-term decisions under pressure. Being in emotionally-charged atmospheres for long. Doing repetitive, routine tasks for a prolonged period. Having a non-challenging, dull work environment. When ISTPs first start to experience stress they become withdrawn and may shut down to the outer world. Gradually as the stress worsens they can feel a compulsion to “get even” with whoever is causing the stress. They feel a need to prove their point, lash out at whoever’s exerting control over them, or argue using logic if they are dealing with an emotional viewpoint from someone else. If stress gets extreme they can become uncharacteristically emotional and hypersensitive. They may struggle with misinterpreting details as signs that other people hate them. Be calm and direct in communication. Be patient as they express their thoughts. Don’t take their blunt criticism or use of impersonal logic personally. Give them space and time alone. Don’t pester them or ask them too many questions. Let them do something that’s calm but also engages their problem-solving skills (a card game, video game, etc,.). Not being able to tell how things will play out. Not knowing what is likely to happen. Not seeing progress on goals. Having to deal with nitty-gritty details for a prolonged time. Having to focus extensively on the present moment. Distress within a close relationship. When INFJs first start experiencing stress they become withdrawn and may shut down, guarding themselves from the outer world. If their stress is work-related they may insist on being involved and developing a plan. As stress builds they start to feel confused, muddled, and unable to focus. They may “play a part” to fit in with the people they care about until they can sort things out. If stress builds to an extreme level they can become uncharacteristically impulsive, self-destructive, or physically active. It will feel to them as if they have lost control and are unable to think in their normal big-picture way. If the stress is related to something you’ve done or need to do, let them know exactly where you’re at and what kind of progress is being done to fix the situation. Be patient as they express their thoughts and feelings. Give them space and time alone to recharge. Refrain from giving advice as this can cause them more stress. Let them spend some time in nature. Not seeing progress on an important task. Not having time to predict how things will happen. Not having their vision appreciated or taken seriously. Having to pay attention to too many details at the same time. Having to focus entirely on the present moment for a prolonged time. Working with people who seem lazy, incompetent, or ignorant. Being in emotionally-charged environments for long. When INTJs first experience stress they seem especially withdrawn and unmoved by outer noise and demands. They need time away from the hustle and bustle of daily life to find answers and if they aren’t given this they will become especially short and dismissive of people who are “getting in the way”. They can find themselves overwhelmed with ideas and plans but feel like everyone else is crowding them out. The more the stress builds the more uncertain they become about their direction. Normally confident and focused, they can lose their signature vision. This can cause them to panic inwardly and they may feel uncharacteristically insecure and unsure. If stress builds to an extreme degree they can become unusually impulsive or focused on physical activity as a way of “doing anything” to get out of their confused mental state. Be calm and clear with them. Give them some time alone as soon as possible. Don’t give them advice. This tends to make things worse when they’re already stressed. Help them sort out which responsibilities they can cancel to reduce some of their pressure. Let them express their thoughts without judging them or interjecting your thoughts. Don’t ask excessive questions or pester them about their feelings. Not getting enough input on a project they’re working on. Feeling “trapped” in a rigid schedule with limiting rules. Having too many demands on their time. Dealing with criticism or confrontation. Having a job that doesn’t appeal to their values. Having to focus extensively on concrete or minute details. When INFPs first begin to experience stress they become quieter than usual, agreeable even. Unless a core value has been violated they will become more conflict-avoidant, feeling an urge to “play a part” so as not to create more stress in the atmosphere. This tends to make them feel perplexed and lost. If stress continues to build to an extreme degree they can become suddenly critical, sarcastic, and focused on “fixing” everything around them. They may seem more aggressive and harsh with people. It may feel to them that they are having an out-of-body experience and saying or doing things that don’t line up with who they really are. Patiently provide encouragement or information they need. Give them time to reflect on the situation and find inner calm. Be friendly, but not too overbearing or expressive. Validate their feelings and frustrations. Give them a break from non-essential responsibilities and let them pursue a creative project they haven’t had time to get to. Don’t give a lot of advice because this tends to make things worse. Not having their ideas and expertise understood. Being in highly-charged emotional environments. Having to do simplistic and repetitive tasks for long. Being “barged in” on or having their privacy disrespected. Not getting enough time alone. Being surrounded by incompetent individuals. Being forced into a rigid, repetitive routine. When INTPs first begin to experience stress they will become especially quiet and withdrawn. Communication will seem halting and they may seem distracted and conflict-avoidant. As stress continues to build they tend to feel mentally blocked and unable to access their normal ingenious thinking. They may suffer from “stage fright”, writer’s block, or an inability to express themselves. If stress builds to an extreme degree they can suddenly become more emotional than usual and more expressive. They may have outbursts or become more hypersensitive to relationships and the moods of the people around them. Give them space and time alone to calm down. Give them time to reflect on information and integrate it into their framework. Excuse them from non-essential responsibilities. Refrain from asking them how they feel or pestering them with questions. Let them know it’s okay if they feel unreasonable. Don’t draw attention to the fact that they are acting uncharacteristically. Did you enjoy this article? Do you have any insights or experience to share? Let us know in the comments! 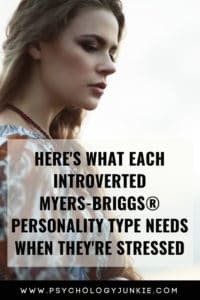 You can also check out my eBooks, The INFJ – Understanding the Mystic or Tranquility by Type: Stress Relief Tips for Your Unique Personality Type. I agree with almost all of this, although having to “pay attention to too many details” is not something I would describe as stress inducing if they are predictable. Typically the struggles I have with stress seem to be centered squarely around working with others. Its easy to say that working with people who are incompetent/ignorant, lazy or even those who simply lack personal initiative is frustrating to me, but I assume that those traits frustrate most people. For me as an INTJ the thing that seems to cause me to feel most unraveled is working with people who behave injudiciously while emotional. This is not something I antisipated in this type of occupation and it seems to wield the precise ability to undermine my sense of control and deplete my energy leaving me stressed. I’m strongly concidering a career shift to an occupation that I have been personally interested in for several years that requires even less interaction with people and is surely more stimulating but I am hesitant to plan such a drastic step during this time of significantly shifting home dynamics as my husband and I expect our first child to be born mid may. Any thoughts on INTJ types coping with emotional/irresponsible co-workers? Or when INTJ types are are bitting off more than our families can chew?